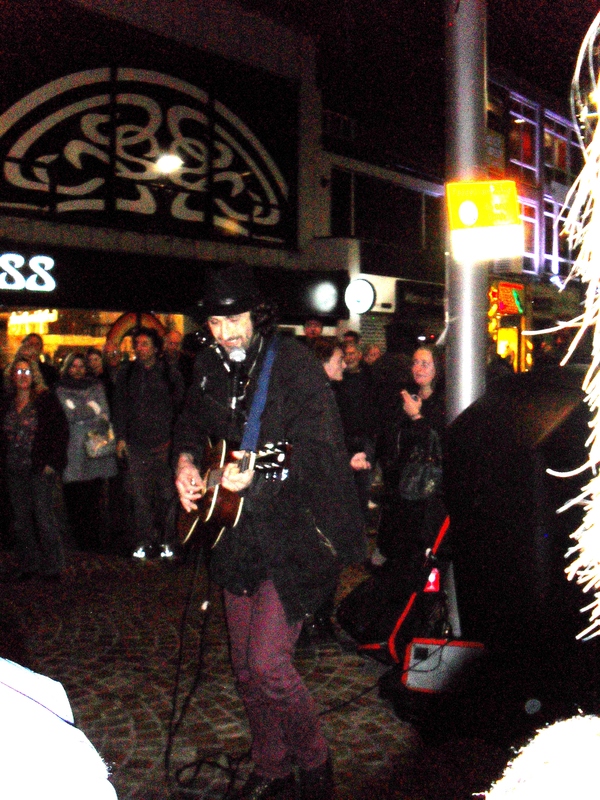 Last night I had the greatest Bob Dylan experience, at the mercy of a busker. For over an hour my brother and I (along with a few dozen other people) crooned and wailed joyously to Bob Dylan hits such as Subterranean Homesick Blues, Blowin’ in the Wind and Like a Rolling Stone, basking in the rough-and-ready raw beauty that Dylan’s music has long represented. Upon arrival in Blackpool on the day of the gig there was a certain air of magic amongst the pregnant teenagers and the flocks of seagulls regurgitating fish and chips on the pavement. The arcades stank of political anarchy and deep Southern drawls echoed through the walls of Wetherspoons. I’ve never been a huge fan of ‘large’ gigs (for myself that would be more than 100) especially a gig with no standing option and I don’t feel that even the presence of Zimmerman himself altered this perception. As a singer/ songwriter who built his ‘empire’ as it were on active involvement with the civil rights movement and a continuous challenging of social and political conformities, a setting such as the Blackpool Opera House was somewhat of a paradox. So, alas, to the charismatic and talented ‘Street Fella’ (self-titled) parked outside of the Opera House, smiling and catching the eyes of the many people who’s lives at one point or another have been defined by a Bob Dylan song. 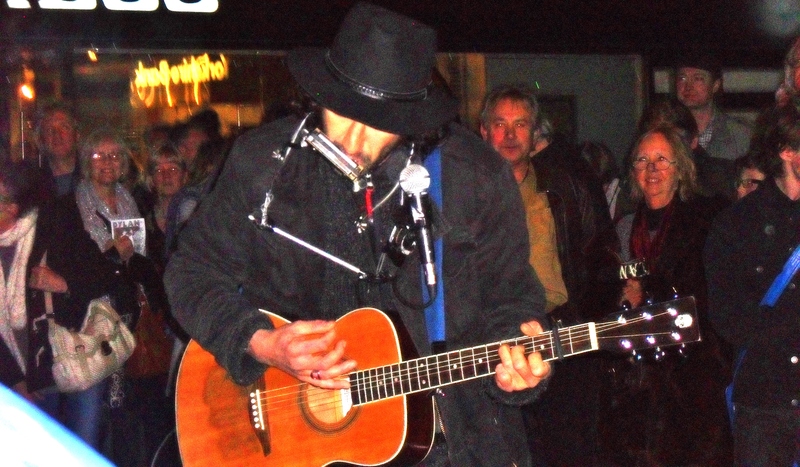 To cheers of “Go on Bob!” and “This is what music’s all about!” the busker strummed, hummed and blew his way through album upon album and year upon year of Bob Dylan’s political poetry. As the time edged ever later a sceptical but mischievous look crept unanimously over the committed crowd’s faces as a police van slithered along, both pigs eyeing up Street Fella with intent. Just this once though, the peaceful harmonies of a few happy music lovers didn’t attract the claws of the police. With a guitar case filled with winking notes and coins, Street Fella knew his time was drawing to a close and pitched two possible penultimate songs, One More Cup of Coffee or A song to Woody. If this were a perfect world then the poem dedicated to Dylan’s hero Woody Guthrie would have been performed, my brother desperately but ever-so-politely requesting the song he read aloud at his father’s funeral just months previous. Of course, perfection is overrated and we still bobbed along contentedly to One More Cup of Coffee (if, indeed, one can ‘bob’ to One More Cup of Coffee). Incidentally, a song from the album Desire which we played repeatedly to our father whilst he lay detached, silent, in a coma. Walking away to the echo of Simple Twist of Fate, we floated serenely- silently agreeing that what Bob had started decades ago was a movement that we are all so proud (and blessed) to belong to. Tags: Blackpool, blackpool opera house, Bob Dylan, Busker, masters of war, Never ending tour, one more cup of coffee, Street Fella. Bookmark the permalink. Thank you for an entertaining blog. Even though it is late and my eyes are tired, I read every word. I could see Blackpool and I could hear Dylan’s band. I nearly went to see him this time but as he is so hit and miss – if I saw him again it was due to be a miss. Have you seen/heard John Prine? Lake Marie? I’m ashamed to say i haven’t Andrew but i will be checking out their music immediately, thanks for the tip and the feedback.